"Any cheese ball is a welcome addition to a holiday party spread, but when you bring one that looks like a pine cone, you're talking about a real showstopper." Stir cream cheese, goat cheese, parsley, tarragon, thyme, garlic, cayenne pepper, salt, and black pepper together in a bowl until smooth and well-mixed. Turn cheese mixture out onto a serving platter and form into a tapered oval shape to resemble a pine cone. 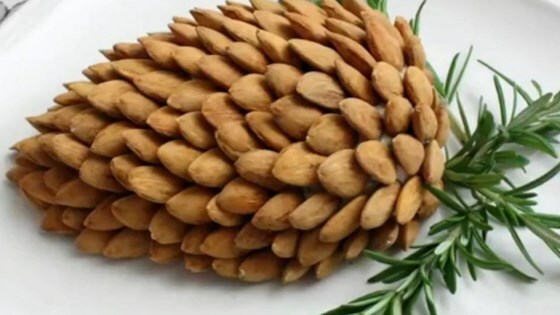 Starting at the tapered end, press almonds into the cheese cone so that the tip of the almond is facing out and down, and cheese cone is completely covered with almonds and resembles a pine cone. Place rosemary sprigs at the top to resemble pine needles. I absolutely love goat cheese and when I saw this recipe included it I knew it would be a hit. I doubled the recipe to make two and they were completely devoured at my party! The only problem I had was everyone thought it was to pretty to eat! Hilarious! My sister used to make a pinecone cheesball 60 YEARS AGO -although I'm not sure the ingredients were exactly the same. Sisters tasted good.